An invaluable resource -- the first of its kind! -- it gives youth ministers everything they need to prepare their own faith-building events. 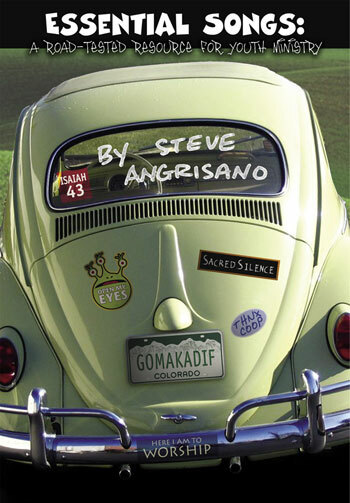 Steve Angrisano is one of the best musical evangelists in the Church today. A 20-year youth-ministry veteran with hundreds of events under his belt, he's mastered the art of drawing people -- young and old -- into an encounter with God. Balancing exuberance and intimacy, he creates an atmosphere that opens hearts -- and fosters conversion. How does he do it? Essential Songs: A Road-Tested Resource for Youth Ministry brings you "behind the curtain," revealing the planning and prayer behind Steve's powerful events. The book provides music for 37 of the most popular contemporary Christian songs (melody and text with guitar chords). Familiar from youth event and camp settings, they include hits by Steve, Matt Maher, Jesse Manibusan, and Tom Booth. All the best call-and-response and hand-gesture songs are here -- "Trading My Sorrows," "Pharaoh, Pharaoh" -- as well as now-classic songs by CCM greats Chris Tomlin, Tim Hughes, and many others. Steve outlines four distinct stages of a successful event: warm-up, transition, prayer and celebration. He explains each stage in detail in the introduction, then gives additional advice in the performance notes. Songs are organized according to use (e.g., warm-up songs appear within that section). Practical tips for developing "craft" and "transparency"
Writing in a candid, casual style, Steve says there are two things every presenter needs: transparency and craft. Built on personal prayer, transparency is allowing God to speak and work through us. Craft is the skill-set behind leading a group, telling a story and singing a song. Steve gives practical tips for developing both. Designed for event leaders, the spiral-bound Resource Book features handy section tabs, making it easy to flip to the songs you need, and a dry-erase planning guide for your set list. Event-goers can use the affordable words-only edition to follow along. This handy booklet includes complete lyrics for all 37 songs. What does a great event look and sound like? Steve's new CD, Live: Songs from the Road, recorded in concert, features 14 tracks from Essential Songs. It's a great illustration of what can happen when you apply these principles. "It's my great desire," Steve says, "to pass along a little bit of what I've learned through the years, traveling and speaking with young people." Essential Songs does just that, and more. An invaluable resource -- the first of its kind! -- it gives youth ministers everything they need to prepare their own faith-building events.